On a beautiful late spring afternoon, this past year, a young woman received the devastating news. She had just gotten back her score on the ACT test. It was not what she had hoped for. In fact, it was not even close to the expectations she had and what she thought her 4.0 grade point average would help her score on the ACT test. The worst part was that she knew that she could never get into the university she had planned to go to with an ACT test score that low. Then she remembered her friends and felt even worse. All of her closest high school friends had already gotten their ACT test scores back and had already been accepted into the university they all planned to attend together. She had been procrastinating about taking the ACT test, because she hated standardized tests, and this only confirmed her hatred. "Why do you have to take the ACT test to get into college?" she angrily wondered. She didn't look forward to having to tell the embarrassing news to her friends. "What would they think of her?" she thought, eyes brimming with tears, as she imagined her friends starting college without her and the isolation and exclusion of being the one left behind. Unfortunately, this hypothetical situation occurs all the time. Someone thought they were going to a prestigious university, told all of their friends, made plans for the future, picked out a degree, and then got an embarrassing reality check from their score on the ACT test. Contrary to popular belief, the ACT test is not a measure of your academic performance, which is why students with a perfect 4.0 GPA rarely score a perfect 36 on the ACT test. The ACT test is quite simply a measure of how well you did on the ACT test, which can be broken down into individual subtest scores on the English, Math, Reading, Science Reasoning, and optional Writing sections. Colleges and universities use the ACT test as a standardized measuring stick to determine who gets admitted and who benefits from the best scholarships they have to offer. While it may not be fair, a student's entire academic career in high school can be completely overshadowed by a single score on the ACT test. That is the whole purpose of the ACT Exam Secrets study guide: to give students the keys to understand how to succeed on the ACT test. If you'd like to get the ACT test score you deserve, to quit worrying about whether your score on the ACT test is good enough, and to beat the test taking game, then this might be the most important message you read this year. Our comprehensive study guide for the ACT test is written by our test experts, who painstakingly researched the topics and the concepts that you need to know to ace your ACT test. Our original research into the ACT test, offered by the ACT, Inc., reveals the specific content areas and the essential skills that are critical for you to know on the ACT test. We've taken the information and developed a study guide that is guaranteed to help you be successful on the ACT test. Our company's name is Mometrix Test Preparation, and we have a team of standardized test researchers who have worked on developing our study guide for the ACT test. The standards for who gets to work on the team are very strict. We demand the best for our customers, and only those who met our exacting standards made the cut. The dedicated research staff have years of combined experience in mastering the content and skills necessary to succeed on the toughest exams. Some academic studies have revealed that test takers do not really benefit from the traditional test preparation process. But we knew there had to be a solution. If test takers were not doing well on the ACT test despite high intelligence, there had to be a set of secret keys to the test that would open the door of success for these test takers. We created the product in part because we were frustrated by the options available to test takers who really wanted to do well on the ACT test. A common approach is to TEACH the material, instead of TEACHING THE TEST. That's not necessarily good enough for the ACT test. You have to know how to apply the knowledge. Most test takers already have a general knowledge of the material that will be covered on the exam. One reason some test takers do well on the day of the test is that they have made the critical connection between the material they learned and how to use the material to succeed on the ACT test. Shows you super speed methods to get through the questions you know with ease, saving you time so you can concentrate on the hardest questions without having to rush. Details the EXACT STUDY PLAN for the ACT test that we believe gives the most results in the least time. No matter if you're studying for a week or a month, you won't waste the precious study time you have on useless activities. Shows how to use ACT's score reporting system to your advantage- You can use ACT's own system against them to get a higher score- this technique is so obvious, we wonder in amazement why ACT allows such a gaping hole in their system! A comprehensive Mathematics Review written in some of the easiest non-technical language you've ever read. You get a plain talk refresher on the most critical areas you will need to master for your ACT Math. Before we go any further, let us clarify what ACT Exam Secrets is not. It is not a stale rehash of all of the things you have already learned in the past. ACT Exam Secrets is our exclusive collection of the tips and the information that we have specially selected to give you the best results on the ACT test for the least time spent studying. It's written in everyday language and is easy to use. We cover the essential skills necessary to do well on the ACT test, plus comprehensive reviews covering the English, Math, Reading, Science Reasoning, and optional Writing tests individually. One: The guide must be written by writers who have painstakingly researched the topics and concepts needed to succeed on the ACT test. The blind cannot hope to lead the blind. ACT Exam Practice Test Questions: Think you're ready for the ACT test? Test yourself using our practice test questions. Find out if you're prepared or if you need to head back to the study guide for another review. Use our practice test questions to make sure that you're not caught off guard on the day of the test! Our ACT practice test questions give you the opportunity to test your knowledge on a set of questions. You can know everything that is going to be covered on the test and it will not do you any good on the day of the test if you have not had a chance to practice. Repetition is the key to success and using the practice test questions allows you to reinforce the strengths you already have, while improving the weaknesses that you need to overcome. Detailed answer explanations are included for the questions. It may sound obvious, but you have to know which questions you missed (and more importantly why you missed the question) to be able to avoid making the same mistakes again when you take the real test. That's why the practice test questions we include for the ACT test include answer keys with detailed answer explanations to each question. The in-depth answer explanations will allow you to better understand the questions that were difficult for you or that you needed more help to understand. Study Skills teaches you everything you need to know about studying, so that you can maximize the effectiveness of the time you spend in preparation; the techniques provided are guaranteed to get you the results you deserve on the day of the test. Study Skills is the most in-depth, comprehensive study manual available and is completely free with the purchase of ACT Exam Secrets. What Your ACT Test Score Means for Admissions and Scholarships: Go "behind the scenes" at a college admissions office and see what your score REALLY means to the admissions counselors. Time Statistics and Constraints: You'll face a lot of time constraints while taking the ACT test. We break down the minutes and seconds for you and show you just what you're up against and make sure that you maximize the time you have at your disposal. ACT vs. SAT: Ever wonder about the difference between the ACT and SAT. We review the two in detail and compare them side by side to show you how they stack up against each other. Undergraduate School Secrets is written by a team of experts, who know what is required to get into undergraduate school and then be successful. Undergraduate School Secrets normally retails for $29.99, but is here available completely free along with your regular purchase of a copy of ACT Exam Secrets. ACT Quick Reference Guide: Ever heard of the 80/20 rule? Guess what - it applies to studying too. Eighty percent of the stuff that you need to know on the test can be learned in twenty percent of the time. That's why you need our ACT Quick Reference Guide! Our ACT Quick Reference Guide is condensed study material. We've taken the basics of the test and boiled it down to the most important concise facts and need-to-know information. Our goal was to create a set of cheatsheets that you can print out that would allow you to do a quick review in a short amount of time. Unfortunately our cheatsheets don't give away the actual answers to the test, but they do the next best thing. They give you that basic review of the most critical things that you need to know to be successful. We insist that you order ACT Exam Secrets entirely at our risk. That's why when you order from this site it comes with a Risk-Free, 1-year 100% Money-Back Guarantee. There's absolutely NO RISK on your part. Why are we going to such great lengths? So go ahead and order your copy of ACT Exam Secrets today. Take the time to read it, use it, and profit from it. If you use any one of our secrets, and somehow fail to recoup your small investment in the form of the test result you want, send us an email at support@mometrix.com to arrange a 100% refund of the product price. ACT Exam Secrets can be ordered directly from this site. A printed copy will typically ship within one business day from our shipping facility. Or, if you prefer, you can order the study guide as an instantly downloadable ebook. It doesn't require any special software. If you can read this web page, you have all you need to start using and applying ACT Exam Secrets in just five minutes. You don't have to wait for anything to come in the mail. Download ACT Exam Secrets immediately! It's easy to order your copy of ACT Exam Secrets. The entire comprehensive package retails for $56.99, but is available to you today at the incredibly low price of $29.99. Just click one of the links below. If you would like to order through the mail, click here to order ACT Exam Secrets study guide by check or money order. 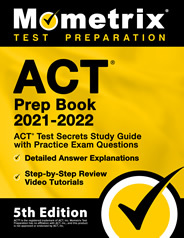 ACT® is the registered trademark of ACT, Inc. Mometrix Test Preparation has no affiliation with ACT, Inc., and ACT Exam Secrets is not approved or endorsed by ACT, Inc.